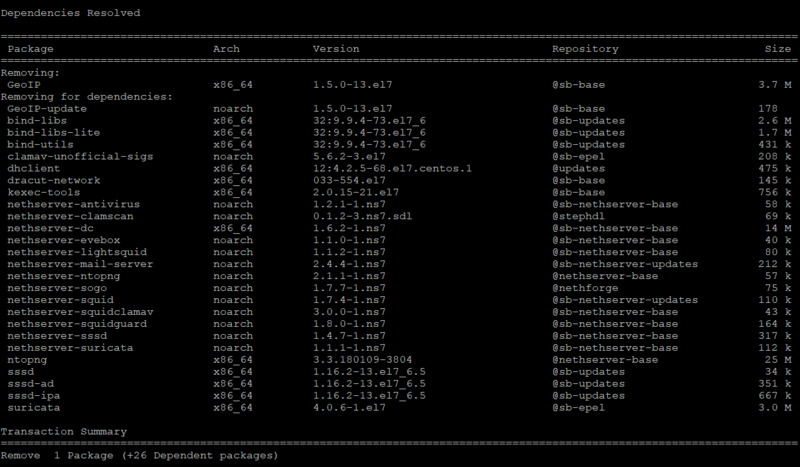 RHEL states that this’ll be a wontfix, so CentOS also. Which modules are using geoip? ntopng? phonehome? Which else? Still getting those messages. Any news on this? Is it a dependency of some Forge package? If I’m honestly I don’t know. I thougt it is part of ntop or suricata, so they can locate hosts or something. If it’s not NS related, I’m sorry to bother you. This machine is migrated from NS6 to NS7. Maybe an old artefact? What do you think, can I savely remove?? The issue (again, AFAIK) comes from a change from MaxMind. which are provided in CSV and binary format. Also with API for manage. Data is provided under Creative Commons Attribution-ShareAlike 4.0 International License. Thank you for your hints. I read about the change of maxmind from geolite to geolite 2. But my question now is: why do I have geoip at all on my system, if it isn’t from NS? If I don’t need it anymore, I’m glad to remove it. You’re removing too many packages! But why do I have GeoIP on my system? Why does so many packages have a dependecy on GeoIP, when it’s not NS-related? @mrmarkuz is right, but I don’t why you had GeoIP-update installed. @giacomo and @mrmarkuz thank you for your answers. So I was right with my assumption that GeoIP is needed for notop and suricata. But if GeoIP 1.x is no longer supported and the database no more updated, it’ll become more and mor inaccurate. Wouldn’t it be worth to think about a change to GeoIP 2.x or something similar (i.e. ip2location lite)? I think that both projects will have to take that decision… Suricata and NTOP will take a choice and will upgrade. Therefore, NethServer maybe can upgrade package too. Or change addon.